Besides picking up a Skewdriver (which we mentioned a while back and saw some great comments on — watch for a hands-on soon), we’re also thinking about grabbing Spec Tools’ “dual action ratchet.” Think of it as a GearWrench-style pass-thru ratchet that also rotates when you squeeze the handles. Seriously, if you’re planning on doing any serious work inside your vehicle, you’re going to need a full compliment of 0-degree-swing-angle tools like the Skewdriver and this. Any job behind the dash starts with a stream of absurdly-placed and ludicrously-tight fasteners. 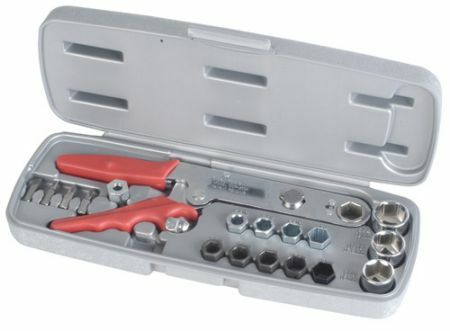 The dual action ratchet comes with fifteen differently-sized sockets (scattered across the range of metric and SAE sizes), and you can always turn the ratchet normally if there’s room. Froogle finds one for $41, but most retailers sell it for $50. There is a knockoff on eBay for $6 if you want to play around a bit before you commit. Amazon has ’em for $51. I think I’ll order mine now. Have people that have hands on experience with this or similar tools found them to generate enough torque? I have a similar set that I bought for a specific pair of bolts on a Fiat 124 in the early 1970’s. It has been used rarely since then, but occasionally, it’s the only tool that will get into a really tight spot where there’s no room to swing a ratchet. Most recent use was on the carburetor mounting bolts on a wood chipper. I was able able to apply enough torque that the gasket compressed and I got a good seal. How much torque? Apparently enough. i don’t know… i have one of these and while i have not measured the torque, i find it pretty useless for un-fastening. nut just won’t budge. but i work in theatre, not cars, so perhaps it’s just a matter of it being a specialty tool. I’m with Sam on this one… I had one but gave it away. I can think of many times that I didnt’ have enough room to swing a ratchet and this would have REALLY sped up the process of tightening a bolt/nut. It doesn’t need to produce a lot of torque, as it’s main purpose would be to speed up the tightening/loosening process, one can crack it loose or snug it up with a wrench for the tough parts. I’d pick this up if it were less than $50.. that is too much money and I’d probably just end up doing it the slow way (wrench). That is just by budget talking though. Hi , yes a great tool not intended to either “crack” a tight fastener or to apply torque but to run the thread up quickly.Works great ,not one you use daily but jolly good when needed !! !